Perros Peligrosos: Morga to Portugalete, Castro-Urdiales, and Islares. Days 6 through 8 of my Camino del Norte saw some rest days, a lot of pintxos, and a number of friendly dogs. It also saw Rie abandoning me to go back to Granada. Waking up in our hostel in Morga/Eskerika, we set out for Bilbao, on what would be Rie and I’s last day together. It was a somewhat hilly day, which started by ascending before rounding some hills and seeing some very Australia-esque landscapes. It was quite muddy, and at one point I decided to make a nice bridge across some mud which Rie labelled ‘dangerous’. Dangerous! Geez. Just outside Bilbao we had one more uphill. Rie took off, as we had a rhythm: I was faster downhill and on the flat, whereas she was faster going uphill. So we spent a lot of time passing each other and then catching up, it worked very well. Anyway at one resting point, there was a high chain link fence with a big bulldog behind it. Naturally I said “hi puppy!” and completely lost my cool, and it trotted over to the fence for a pat. Then another gigantic dog joined it, pushing in so that he could get in on the action. They were the friendliest ever! Walking away, I saw a sign saying “Caution! Guarded by dangerous dogs!”. Upon reaching Bilbao,we had some final pintxos and coffee before going our separate ways: Rie was staying in town before heading out on the coach, while I was staying in the public donativo albergue overlooking the city, a few km further on. I had my typical tortilla de patatas (somehow they never got old), and some kind of horrible deepfried zucchini brie-based thing. It was feral. Farewelling Rie and reaching the donativo, I was greeted by some resounding snores. The lady was clearly asleep, so I checked myself in and got set up. A little while later, a Dutch girl arrived and woke the lady up–but the Dutchie spoke no Spanish, and the lady no English, so I was roused to translate (!?!). On the upside, the Dutch girl then went to go and buy me food, because I was pooped. I got to put a pin in! I NEVER get to put a pin in!! The Dutch girl eventually came back, clutching a bread roll and the all-important chocolate for me. Then the three German girls who had been at the hostel in Eskerika that morning arrived, so we had a little chat despite my semi-conscious state. Eventually, as I was about to eat my bread roll (so the chocolate, obviously) and go to sleep, the hospitalier Maria came into the room. Nobody else understood what she was saying, somehow, and so she came up to me tapping her watch and saying something about a quarter of an hour. As it turns out, Maria had made dinner for us! And…we were all vegetarian. Poor woman. But I went to give her a hand in the kitchen, and we had a lovely communal dinner. On day 7, I was so tired when I got up in the morning that I now find it hard to believe. 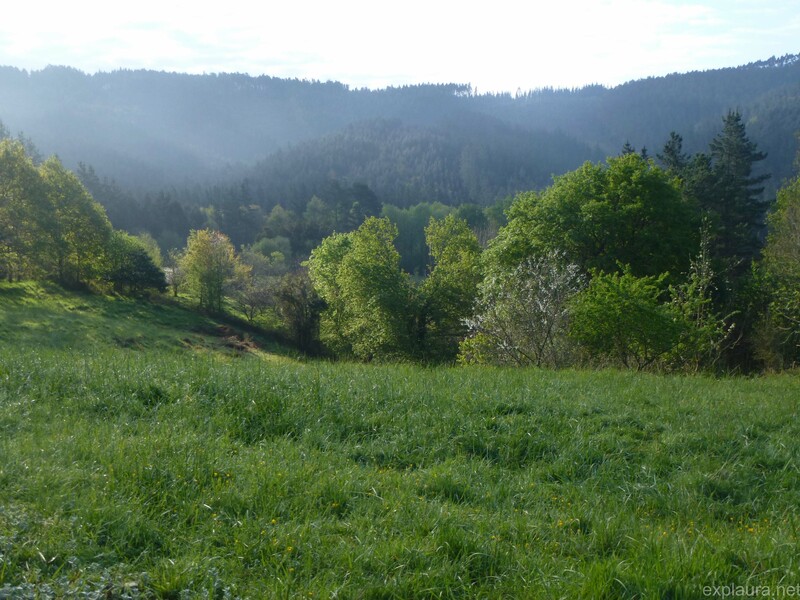 Just moving was difficult–but it’s only possible to stay in the non-private albergues for one night, and I sure as heck wasn’t retracing my steps. 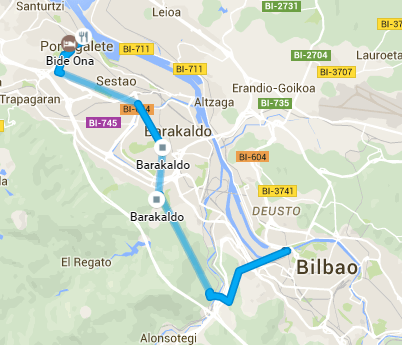 As such I decided to walk to Portugalete, which was only 14km away. That 14km took me around 5 hours, because I was completely exhausted. As such there were a lot of coffee stops, and naturally, a lot of petting of friendly dogs. There were no real adventures on this day, as the landscape was super boring. It was mainly industrial, and the scenic highlight was probably an IKEA in the distance. I did end up on the wrong path at one point because there was a signed choice to go left or right (by which I mean two yellow arrows pointing in opposite directions with no furthe rinformation…). I chose left rather than right and so ended up walking along the interior rather than the river. Apparently the latter was equally dull, though it had the upside of a World Heritage listed bridge. Then again, it’s a bridge; who cares? Arriving in Portugalete I headed straight for Bide Ona, a small family-owned hostel. After speaking a somehow passable amount of Spanish, I went off to get the hugest of humungous meals. Despite that, I was hungry a couple of hours later so went to get yet, more, food. I don’t even know how it all fit into my body! After an early night I woke up on day 8, and was still too tired to string a sentence together. I decided to have a proper rest day, with no walking between cities. As such I chilled, read a few books, ate another plate the size of my rib cage, and that’s about it. Stopping for a day was odd in that the people who had started a day behind me started appearing, and the American couple Dan and Audrey turned up. In the end, I’m glad I got the rest, because the next day would be epic.